For many people sending holiday cards is a tradition that continues to be practiced even with the advances in technology. Actually, now more than ever it is becoming even more easier to have your cards custom made and personalized to your liking. With Minted, you can find the perfect holiday card for your style and budget, with luxe paper and printing across a wide range of formats. 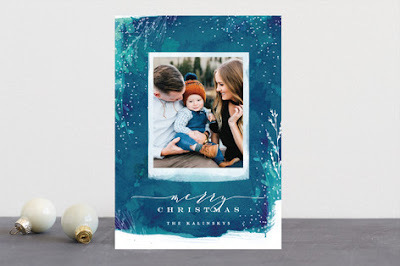 There is FREE recipient addressing on all cards, from their original Holiday Cards to Foil-Pressed Holiday Cards to Letterpress Holiday Cards and more. Cards can be made uniquely yours through the extensive personalization options we offer, including colors, shapes, paper upgrades, backers & interiors and free recipient and return addressing. This year, Minted launched a NEW service called Text Us Your Photo. Simply text them your favorite holiday photo, and your Minted stylist will text you back your photo styled in 5 holiday card designs along with a greeting and family name - for FREE. Your saved card designs will be waiting for you in your Minted account. Select your favorite design and check it out! Find It Fast - this tool saves time by allowing you to see your photo in every holiday card design at once. Buy Now Personalize Later - Take advantage of a promotional offer and buy your holiday card now. You can come back to finish personalizing with photos, text, or addresses at any time. Here is a preview of some my favorite cards. 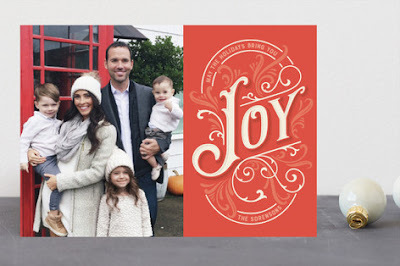 These were also all included in Minted's top voted holiday cards. GeekInk Design stays true to his signature style but reinvents the classic holiday photo card. His ornate typography and unique embellishments come together harmoniously to create a statement hand-drawn illustration. We couldn't have asked for a better design that showcases typography than Sarah Brown's multi-photo card. Although the typography is the star of this design, the use of gold foil and light grey pine leaves allow the color in the photos to pop. We can definitely tell that Chris Griffith too the time to select the perfect serif, sans serif and script fonts for each word and carefully thought about the placement of text in this design. Customers looking to share their their treasured memories will fall in love with this vintage-inspired design. The gold-foiled "Joy" in Three Kisses Studio's design truly shines against the subtly textured, maroon background. It's unique seven-photo layout gives space for families to showcase a variety of photo orientations and sizes. Lori Wemple recreated a winter wonderland in her design. She layers intricate hand-drawn details and shades of color throughout her design and all of the well-balanced elements beautifully frame the photo. Which one is your favorite Holiday card? I love Minted for everything! They provide the best quality and the best designs. I'm hoping to do our Christmas card with them again this year. Yours are gorgeous! That's a great idea that Minted has implemented where you text them your photo. I've done my cards this year, but I'll keep it in mind for next time I order photo card. These cards are all beautiful! I love sending Christmas cards! I never miss it and love finding the perfect design every year. These are some great options. Love Minted! We used them for our wedding save the dates and invites! 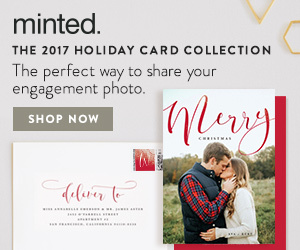 We are taking Christmas pictures this year and I'm already browsing Minted to find the perfect design! I did my holiday cards with minted this year as well!! 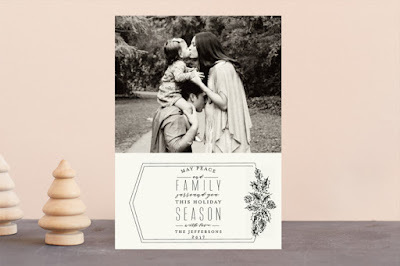 I get my holiday cards with minted every year! Such a great selection.